Research shows that richer countries are happier than poorer countries, and well-being rises with income at all levels of income, across countries. Happy people generally earn more than unhappy people. It has been now determined that there is no maximum wealth threshold at which point higher incomes cease to boost well-being. The previous edition of this newsletter in April was different from the usual BeHappy! Newsletter. Even though it wasn’t really part of this “Money” series starting now, it was a financially-related opportunity for anyone interested in generating a long-term passive residual income, either as part of a multiple-streams-of-income strategy (like me) or as a primary income for the future. Did you check it out? If so, I hope you see the chance to be part of a ground-floor opportunity in the social media space. If not, click here or on the big orange icon in the box to the right and check it out now. It will only take a few minutes of your time and I know you’ll be happy you did. There is still time to get in on the “inner circle” as Rippln launches fully to the public soon and goes “viral”. Don’t miss out!! Click here now to check it out for yourself. As stated in the previous edition of this newsletter, money and wealth represent aspects of life where many people feel they can create more happiness, while other people have the belief that “money cannot buy happiness” (so they feel money and happiness are unrelated). If your Definition of Happiness includes a financial, income, or wealth component (either directly or indirectly), then money and wealth will be more important to your overall happiness (i.e., it can “buy” some degree of happiness) than someone whose Definition of Happiness does not include money or wealth as one of the components (where money – or at least an abundance of money – would not likely contribute much to their happiness). True and total happiness for any of us is dependent partly on our ability to live consistent with our own personal Definition of Happiness - which is different for everyone. So, if your Definition of Happiness includes money and wealth as one of the components, then money will be more important to your overall happiness than someone who does not have money or wealth as part of their definition. Next, there is no right or wrong answer to the question, “does money buy happiness?”. Again, this is partly based on #1 above, but there are many reasons. Even if money and wealth are not part of your definition of happiness, but you are struggling financially, have children to feed and support, with a mortgage or rent and bills to pay, but can’t do those things, there is likely a lot of stress, anxiety, and unhappiness associated with this situation. This same person would be much “happier” if the bills were all paid, the rent was a non-issue, and the children were well-fed and supported. In this case, money does “buy happiness” to a certain extent – at least during times of adversity, stress, and need. So, again, the answer to the question for this person may generally be “no, money does not buy happiness” (since money and wealth are not part of their definition of happiness) but under the circumstances described, money is a serious issue and it can provide some degree of comfort, relief, peace-of-mind and, yes, happiness. The third reason the topic of money “buying happiness” is basically ridiculous is that, in reality, there is no one thing in this world that, by itself, can make us totally and completely happy. A great job or career can’t. Spiritual or religious beliefs can’t. Perfect health can’t. Adventure and fun can’t. Even great relationships can’t. All these things can surely help lead to a happier, more fulfilled life (some perhaps more than others), but none of them alone can usually do it. So, why do so many people focus on money as the “one thing” we could expect to make us happy? The only way to be totally and completely happy in life is to know your personal definition of happiness and live consistent with that definition. It’s that simple. Not easy, but simple. Now, please understand that I am not saying that money is a creator of happiness. As I have indicated above, it is possibly just one of many things in your life that could make you happier. But money alone is unlikely to do it – just like none of the other aspects of life alone will do. Income:The amount of monetary or other returns, either earned or unearned, accruing over a given period of time. Net Worth:The difference between an individual's total liabilities and assets (Click here to learn more about net worth and how to calculate it). If either (a) money and wealth are part of your personal Definition of Happiness or (b) you are stressed, anxious and "unhappy" because you are struggling financially, you really must understand how to improve your financial situation and achieve your financial goals. The two fundamental parts of this process are income and net worth. It is beyond the scope of this newsletter to get really deep into these two subjects since it would take many pages of information to do so. For our purposes here, it's sufficient to introduce these concepts so you can start to evaluate your income situation and calculate your net worth. We will then build on these concepts in the next two parts of this money and wealth series in the next two editions of the newsletter (in August and October). Income: When referring to income, we are talking about the amount of money you have coming in - either earned or unearned - on a regular basis (weekly, bi-weekly, monthly, etc.) either through active ("work") income or passive income that you can use to pay for your living expenses and lifestyle - as well as save and invest for the future (which helps build your net worth). Income is certainly important for "paying the bills", taking vacations, and even enjoying any luxuries you may want or hobbies you may have, but generally it is not the sole component to building wealth. Most people live "paycheck to paycheck" (or perhaps don't even have it that good) and so, there is no chance to save or invest for the future. It is a constant struggle. Unless you are different from most people, nothing is certain in life these days - including a continual life-long stream of income. So, it is critical that you have an income plan for the long-term. This includes a multiple-streams-of-income strategy (which we will focus on in the August edition of the newsletter), including at least one passive income stream. Also, you should have a contingency plan, just in case. You should establish ways to increase your current source of income (your "primary source of income"). Again, we will get into this further in the next two parts of this newsletter series on money. Net Worth: As stated in the box above, net worth is the difference between an individual's total liabilities and assets. If building wealth is one of your goals (because it is part of your Definition of Happiness), then you must have a strategy to increase your income to a level that will allow you to build your net worth to whatever level you need to be happy by (1) staying out of debt (eliminating or reducing your liabilities) and (2) increasing your assets (mostly through investing and saving). Again, we will more specific on all this in the next couple of editions of the newsletter, so for now, it is important to know what net worth means - and use the tools here to calculate your own personal net worth if you haven't already. Click here to learn more and do it now. Remember, this whole discussion about money - and this whole series on Money and Wealth - are in the context of what makes you happiest and most fulfilled in your life. If money, income, wealth, and financial freedom are completely absent from your personal Definition of Happiness, then this three-part series (the June, August, and October editions of the newsletter) may not be for you (although I believe it is good for everyone to read and understand). If, however, there is any relationship between money and happiness for you in your personal Definition of Happiness, then this series is a must read for you. 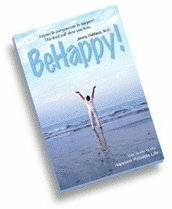 Take these actions over the next sixty days and by the time you receive the next edition of the BeHappy! Newsletter (in August), you will have a head start into this "money and happiness" concept which we'll be exploring for most of the rest of the year in a series on how money can make you happier, how to make more money, and how happiness can help. If you haven't already determined whether your Definition of Happiness includes money and/or wealth as a component, make sure to do that. Click here to learn more about creating your personal Definition of Happiness. Net Worth: It is critical that you know your net worth now - and what you need your net worth to be to live the lifestyle your desire, whether that's just to be comfortable and financially secure, or to enjoy total abundance and the financial freedom that allows you to have and do whatever you want, whenever you want, without having to ever "work" again. So, click here to learn more and calculate your current and desired future net worth. We will use this information in the next two editions of the BeHappy! Newsletter (Parts 2 and 3 of this Money and Wealth series) in August and October. The Happiness Formula Video Course...A FREE 5-Part video course on my “formula for happiness”. Click here to get it free as a gift from me. I am still working on a potential video version of this newsletter. I plan to charge an annual or monthly fee for this newsletter, but will provide either a free or significantly reduced price for you, my current subscribers. I should know whether it will all work soon and will let you know once I know.